that for the long-term portion of invested wealth, stock investing offers an outstanding opportunity for wealth accumulation through growth at relatively low risk. It should be emphasized that the stock market is risky for short-term holding periods, but as an investor's time frame goes beyond five years (10 years, 20 years), this risk is greatly diminished. It should also be emphasized that an expected holding period can change due to unforeseen circumstances (especially in your personal life! ), and this possibility leaves an element of risk. For that reason, even individuals who do not plan on using their assets for many years should not commit all of their wealth to stocks. ♦ A long-term strategy means a time horizon of at least five years. No one should embark on a long-term investment strategy if they are going to need their investable assets in less than five years. Instead, a traditional approach similar to that used in the so-called (later/)withdrawal stage should be taken for shorter time frames. ♦ Individuals should not invest all of their wealth in stocks. This is important because unexpected events may require that savings be used, even if the investor is still accumulating wealth. Taking money out of the stock market at the wrong time can seriously impair an investor's long-term strategy. Thus, the investor should possess a sufficient amount of liquid assets and other investments that can be used for consumption in emergencies. In this way, decisions regarding the stock portion of an investor's wealth can be made with a view toward the long term. An investor can expect that-even with a well-diversified stock portfolio-at least once in an investing lifetime there will be a pullback of 30% to 50%. An investor completely in stocks might panic at that kind of portfolio performance. The latest example occurred in 2008, but such pullbacks occurred in 2001-2002, 1973-1974 and the notorious crash of 1929. ♦ It is important not only to develop a long-term stock investment strategy, but to understand the rationale of such a strategy relative to current stock market investment research and theory. With this in mind, this report-extract reviews some of the basic concepts of investment theory. Almost all approaches to investing are concerned with risk. But what is risk? A practical and somewhat simplified definition of risk is that it is the likelihood that your investment will be worth less at the end of your holding period than it was at the time it was originally invested. This definition could be modified to take inflation into account, by stating that risk is the likelihood that your investment will be worth less in "real dollars" at the end of your holding period. Another refinement would be to state that risk is the likelihood that your investment will be worth less than if it had been put into a zero-risk investment, such as U.S. T-bills. Many investors prefer to turn to a more measurable definition of risk. This definition involves the use of statistics; it measures variability-the amount by which an investor's return could vary around the expected average return. Consider the following example. Suppose an investment opportunity is absolutely guaranteed to have a 10% return over your holding period. Your "expected return" is 10%. Since the 10% return is guaranteed, there is no other possible realized return and hence there is no variability. The risk is zero (Pretty unrealistic, but it gives you a basic idea of this concept). The risk and return trade-off will change depending on the time frame used. For instance, the risk and return trade-off for a one-year holding period will be different than the trade-off for a five-year holding period; in general, stock market risk declines as the holding period lengthens. This helps explain why setting a proper time frame is essential when making investment decisions. So one can define risk as variations in return. But what causes these variations? ♦ firm risk, which is associated with the unique characteristics of any one stock or the industry in which it operates. Firm risk accounts for up to 70% of the total risk that stock investors face. Yet, this risk can be almost eliminated by diversifying among different stocks-investing in, for instance, 10 different stocks rather than just one. Market risk, on the other hand, accounts for about 30% of total risk and cannot be avoided by diversification, since all stocks are affected to some degree by the overall market. Think carefully about that last paragraph! An investor with a single stock in his or her portfolio is taking on 100% of the risk associated with stock investing, compared with only a 30% risk that an investor with a diversified portfolio would take on-in other words, the single-stock investor is taking on three times more risk. Investors who consider themselves "conservative" but invest in one low-risk stock may actually incur more risk than investors with a portfolio of 10 aggressive growth stocks-and the "conservative" investors are getting a lower expected return since they are in lower-risk, lower-return stocks. This illustrates an important concept. The stock market provides higher returns for higher risks, but it only provides those higher returns for unavoidable risk. Firm risk is largely avoidable. No matter what investment objectives investors may have, no matter what the intended holding periods are, no matter what kind of stock analysis is performed: If investors do not have diversified portfolios, they are either throwing away return or assuming risk that could be avoided--or both. The discussion here assumes a diversified portfolio when talking about stock investment. Let's look at the difference in risk as a function of our time frame, or holding period. For this purpose, risk will be defined in a practical way-the likelihood that invested wealth will diminish from the time of the initial investment to the end of the holding period time frame. Examples of risk differences appear in the first of the 2 tables above. The table assumes that an individual is invested in a portfolio of the indicated asset category, and remains invested for the holding period indicated; the table indicates the percentage of times the individual would have suffered a loss if he or she had invested in this fashion from 1926 through 2014. The statistics from which the figures are derived include dividends and interest payments, but transaction costs and taxes are ignored. Clearly, though, the percentage of losses declines as the holding period is increased for all of the asset categories. So what does the historical record tell us about the stock market, as defined by the S&P 500? ♦ If you told your broker to buy a portfolio that matched the S&P 500 at the beginning of the year and to sell at the end of the year, you would have had a loss 24 times over the last 89 years, or about 27% of the time. ♦ If you told your broker to buy at the beginning of the year and sell after three years, you would have had a loss 15 times since 1926, or 17% of the time. ♦ If you told your broker to buy at the beginning of the year and sell after five years, you would have had a loss 12 times since 1926, or about 14% of the time. ♦ If you bought and held the portfolio for any 10 years, you would have had a loss only 5% of the time. If we had adjusted for inflation (used real dollars), there would have been a few more losses for each holding period, but that would be true for all other investments as well. The point is, the variability of returns-risk as measured by the chance of loss-goes down as the holding period gets longer. The second table above presents the returns provided by stocks, corporate bonds, government bonds and Treasury bills over the past 50 years. Stocks are broken down into stocks in the S&P 500 and stocks of smaller firms, which are generally considered riskier investments. 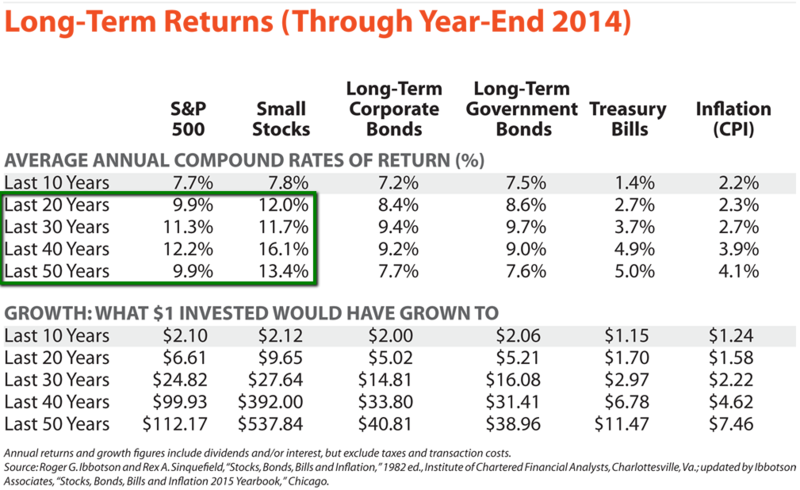 In general, riskier investments provide higher returns. For instance, small stocks have tended to outperform the S&P 500. However, the table shows that performance for a market segment can vary over different time periods. In addition, while Treasury bills are considered riskless, they have provided returns that are only modestly above the rate of inflation over the long run. My two bits: Knowing about the history of stocks-performance and inherent risks they carry within a certain time-frame one can conclude how to look at this asset-class. By diversifying/splitting ones investment over different sectors/stocks - one can reduce the so-called company-specific risks, which could destroy a long-term-target, which hopefully copies the experience/returns we saw with stock-investing since 1928 ( = table-data above). Especially when starting ones investment-strategy one can invest over a longer period - no one needs to take a one-time investment. Often people start with a savings-plan/invesetment plan over several quarters before jumping "ALL-IN". One cannot emphasize the importance of diversification enough. As an example, AAII is managing a Portfolio which consists of about 30 stocks, each one of which is extremely risky. The average stock in the portfolio is over three times as risky as the market in general, but the portfolio is less risky than the S&P 500 index. Diversification eliminated 75% of the individual stock risk.